Electric scooters motorized bicycles .com is a wholesaler and reseller of of high quality electric products including rc electric helicopters and electric mobility scooters. Receive electric scooter news and updates. If you are looking for an All-Terrain Mobility Scooter / Golf Cart, this is the one for you. Built with the highest quality components, the Sola T comes complete with Gel Cell Batteries for the longest battery life achievable, a Powerful 650 Watt Motor allows you to reach areas that other mobilities will not, while riding in comfort due to the rear Monoshock, independent front suspension and huge 13" air filled tires. This mobility scooter comes with a free golf bag carrier and available canopy for the back of the scooter. 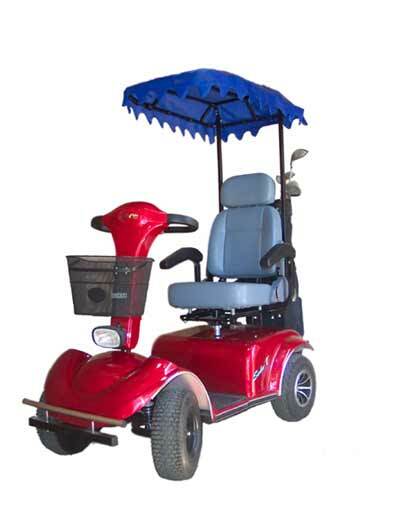 Sola T Personal Golf Carts have Curtis Controllers Made in the USA. They have 42 years as a privately held company headquartered in Mount Kisco, New York, USA . They have went as far as building parts for the apollo mission for NASA . They are a leader in motor speed control and battery measurement technology. Sola Scooters strives to get the highest quality parts available . We ship by UPS "Ground" usually on the same day you order! Place your order with confidence online by using our secure Paypal shopping cart.